Do you follow culinary trends? One that I'm seeing a real spike in interest lately is crockpot or slow cooker cooking within home cooks. I'm definitely a fan of using my crockpot but I will say that I am rather picky about what I prepare in it. I tend to lean towards recipes that require hours of braising, which I'll adapt for cooking in a crockpot. 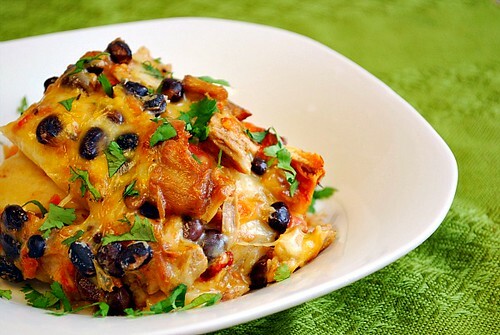 The most recent crockpot dish I've made was for these Spicy Pork Tinga Enchiladas. I didn't make the entire dish in the crockpot per se, but rather just the flavorful pork filling. Boneless, cubed pork is slow cooked with aromatics, broth, tomato sauce and minced chipotle chiles to create the spicy filling for these hearty enchiladas. The enchiladas are filled with this pork, beans, cheese and cilantro for a delicious Mexican dish that's freezer friendly too! For the Tinga: Place all ingredients except tortillas and garnishes into a crockpot. Cover and cook on high for 4-6 hours or on low for 6-8 hours. Remove thyme springs and bay leaves. Using potato masher, mash cooked pork until shredded into rough 1/2″ pieces. (Can be refrigerated at this point for up to 2 days). For the Tinga Filling: In a large bowl, combine the pork filling with the 8oz of cheese, beans and cilantro until well incorporated. For the Enchiladas: Place 1-2 heaping tablespoons of pork tinga filling down the center of each tortilla. Roll up tortillas and place seam-side-down in the baking dish. Cover the enchiladas with the 1 cup enchilada sauce (homemade or storebought). Sprinkle any remaining filling mixture on top of rolled tortillas and sprinkle with the remaining 4oz of cheese. Bake 25 minutes uncovered in the preheated oven, or until bubbly and lightly browned. * To make ahead/freezer meal - Prepare the recipe as directed as above up to the point of filling and rolling tortillass. Place the rolled up tortillas seam side down in a freezer and oven proof baking dish. Sprinkle any remaining filling mixture on top of rolled tortillas and sprinkle with the remaining 4oz of cheese. Cover and freeze. When ready to prepare, defrost and preheat oven to 350 degrees. Bake in preheated oven uncovered for 30 minutes, or until bubbly and lightly browned. Those sound (and look!) amazing! My husband would LOVE these! They look great! These are so vibrant, beautiful and inviting, I just love the background and food styling you've utilized. I made the filling for this tonight(well it actually just cooked away in my crockpot all day). I rolled it up in a tortilla with some guacamole and light sour cream. My husband put it over brown rice. I used super lean pork loin roast so it was very healthy and tasted great. My husband loves all things chipotle and loved it. Thanks for the recipe! I see that enchilada sauce is an ingredient. I cannot seem to see when I add it to the recipe. Hi Kdoltz! Thanks for asking... it's added after all the tortillas/enchiladas are rolled and placed in a baking dish. I've updated the recipe to reflect - thanks so asking and allowing me to update! For the freezer version of these, do you freeze one-cup portions of enchilada sauce separately and pour it on just before baking, after they're defrosted? Do you mash/mix the liquid/onions, etc from the crockpot in with the pork too? Seems like so much liquid? Thanks! Chiming in...in my opinion, what made the Cooks Illustrated version so good was the fact that the pork got crispy, almost acquired a bit of a crust. I am going to cook the pork in liquid, then shred the pork and put it in a skillet to get that crispness. In effect, i am adding a step to your version. Still not sure if I want to make tostadas or enchiladas. Thanks for this post, it has given me a lot to consider. This was amazing! 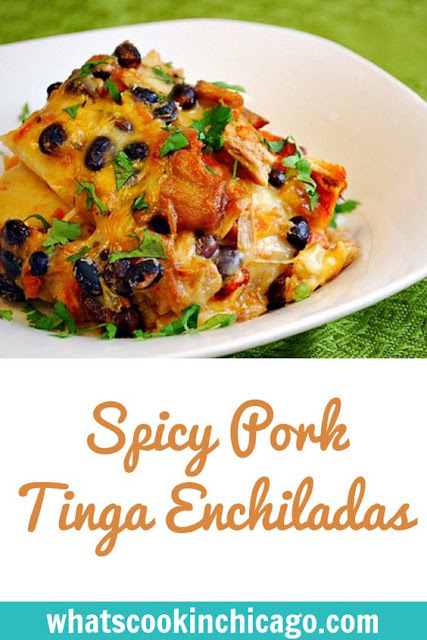 I would HIGHLY recommend putting the pork mixture in the fridge for 24 hours before executing the actual enchilada portion of this recipe. It clumps together to make a hearty filling and molds the spices for a great kick that isn't overbearing. Thanks for the post!